The composer of this piece is Cornelius Gurlitt, a German composer from the 1800s. He really loved writing music with an educational bent, which is why a lot of his collections are etudes, or studies. 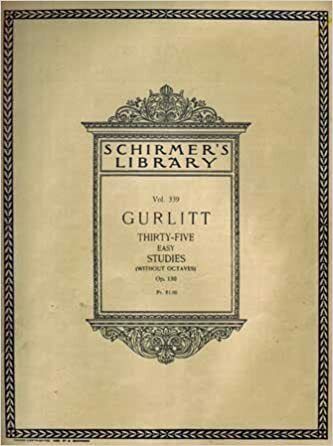 Prayer by Gurlitt is from op. 130, which is a collection of 35 etudes (studies). This is the 4th etude, called Prayer. The way it’s written is mimicking a 4-part vocal composition, or the standard SATB setup you might remember from high school. Keeping everything smooth, seamless and song-like is our main challenge here, instead of making it sound just like a bunch of dumpy chords. First off, the tempo is adagio, Italian for ‘slowly’, which you probably figured out from listening to the recording. Then we’ve got our key signature – one sharp, which is telling us this song is in the key of G major, or based on G major scale. In this piece, there are constant finger markings. They are there to help you keep everything smooth – the most difficult part of this piece is playing slurs with chordal passages. Some of them have a dash, like 4-5 – what this is telling you is you’ll initially play the chord with finger 4 on that note, but while you’re holding, do a little switchamaroo to finger 5. Let’s talk about slurs for a moment. Yes, they’re telling us which notes to play smoothly, but they’re giving us more information than that. Imagining this is a sung composition with lyrics, you can imagine the breaks between slurs to be punctuation, like a comma or period. Or more specifically, the part of the song where you would breathe if you were singing. Piano music needs to breathe as well, as strange as that may seem. If you just slurred all the notes together, it would be hard to make sense of the musical sentences – kind of like if I just started talking in a run-on sentence. Also note the dynamics in Prayer by Gurlitt – it starts at piano (quiet), and later transfers to pianissimo, meaning very quiet. Playing chords is one thing, but playing quiet chords is a whole other ordeal. One of the hardest parts of playing chords is being able to make all the notes sound simultaneously. It’s not so bad when you play loud, as that translates to playing quickly – all your fingers press down in a lightning quick motion. But to play quiet, we press more slowly, which can result in a bit of a choppy effect. If you’re having trouble with this, a good exercise is to alternate the outer notes of the chord with the inner one, before putting them all together. Prayer by Gurlitt is a deceptively difficult song for beginners, so give yourself lots of time to really work out the notes and the details. Unless you’re very adept or practice a LOT, don’t expect to master this in a week. Take it one phrase at a time, and don’t omit the finer details, because even when you’re just starting you want this song to have a beautiful, lyrical quality to it.